• Increased connection with mother earth. Wearer gets luck and assets of properties and vehicles. • For chanting mantras for planet Mangal (Mars). 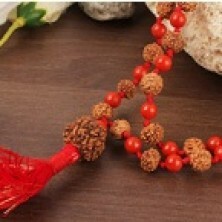 Red Coral gives the wearer qualities such as bravery and courage to face any situation. It can be worn for a blissful married life. Description: Rare mala of uniform 6 mukhi Java with coral beads.